Brainstorming Backyard Patio Ideas... Five Ideas Start With. Thinking of creating a new patio in your backyard? Need a few backyard patio ideas? Let us help. After a quick brainstorming session, we came up with these five backyard patio ideas that will be sure to please. A common, yet still exciting backyard idea is to combine a patio built of stone, brick, concrete or other typical patio materials with a traditional wooden or composite deck. Or try building a patio with a wooden decked gazebo or observation area. This effect makes for a great private area to set up a dining or conversational enclave, really setting your patio apart from the rest! 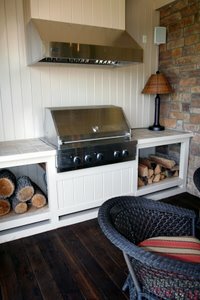 While not one of the cheapest backyard patio ideas, creating a gourmet outdoor kitchen will be sure to impress everyone! Think about the perks and advantages of being able to entertain exclusively outdoors without even having to go inside. For the cook, there’s a huge variety of grills and ranges specifically designed for permanent patio installation. We’re not talking your ordinary everyday charcoal or gas grill here (although there’s certainly nothing wrong with that either). How about an outdoor built in refrigerator or wine cooler? Or design a built in ice pit to chill your favorite beverages on a warm summer night. Oh, and for those cool nights, to get some extra life from your patio, don’t forget to add an outdoor patio fireplace. They can be had to burn wood or propane, or you can go all out and have a pro install a gas line for you. Bring back the Victorian age with a patio that is designed to fit the time period. Porch swings and old fashioned rocker chairs can help to evoke the feeling of a bygone era. Or perhaps you want something a little more modern, but still with a funky retro vibe. Find some old metal rocking chairs at an auction and build in an area for shuffleboard. Eclectic, yet fun backyard patio ideas! For another unique backyard patio idea, think about inverting the whole layout. If you have a small back yard or area for your patio, install edging for your patio made of common backyard patio materials like brick or stone. 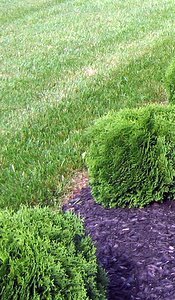 Or perhaps you could try other traditional or creative edging ideas such as small bushes or an area of mulch with flowers or other complimentary plantings. This border or edge you create will define and box in the patio space. Then fill in the useable area of the patio with a thick and dense grass turf. This idea is sure to give you the feel of a traditional patio without giving away the luxury of still having grass in your backyard. Does one these backyard patio ideas appeal to you? If not, don’t be discouraged. You can make your backyard patio fantastic in so many ways. Just be creative and the right idea will come to you!